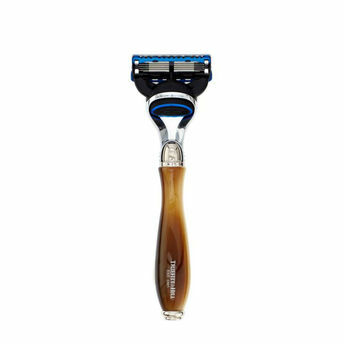 Experience the smoothest shave ever with Truefitts "Wellington" style razor with a Fusion head. Made in the UK, The specially weighted and ergonomically hand-crafted razor handles are designed to assist in giving you the smoothest, Safest shave possible. Available in Faux Ivory, Horn, Porcelain and Ebony with a chrome finish. Explore the entire range of Razors & Cartridges available on Nykaa. Shop more Truefitt & Hill products here.You can browse through the complete world of Truefitt & Hill Razors & Cartridges .